Applications of narrow fabrics range from simple, practical purposes to decorative and high-performance applications. Automotive, cargo handling, defense, furniture, luggage, industrial lifting, medical, outdoor/leisure, pet products and saddlery, safety (construction, forestry, mining, oil rigs), toys, and sporting goods are some applications of narrow fabrics, all presenting different requirements. Garment industry; clothing, safety vests, sportswear, shoelaces, sandal straps, trouser belts, waist belts, suspenders, draw cords for jackets, etc. Bags and luggage; Straps and webbing for sports bags, duffel bags, golf cart bag holders, rucksacks, promotional bags, tote bags, school bags, back packs, casual bags, outdoor bags, laptop bags, soft-sided luggage, etc. Lifting and safety; Lifting slings, safety harnesses, rescue cradles, rescue ladders, fall protection systems, safety straps, belts, climbing equipment, etc. Other Applications; Straps for bottles, thermos flasks, cameras, wrist watches, pet collars/leashes, horse halters, saddlery, athletic equipment, camping equipment, etc. Automotive industry; seat belts, child restraints, tow straps etc. Healthcare; adjusting straps, wrist braces, straps, restraints, etc. 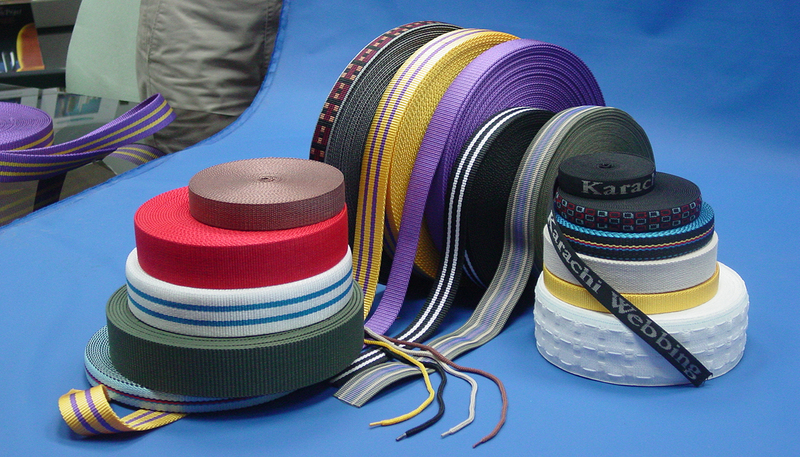 Industrial and tiedowns; tiedown straps, reinforcement for awnings, tents, and canopies, narrow woven belts for truck curtain sides, cargo restraints, industrial lifting and safety, high strength webbing for jumbo bags, ropes and cords, etc. Military; belts, helmet straps, rifle slings, cargo nets, tiedown straps, etc. The variety of characteristics that define a particular narrow fabric are numerous. Material (yarn), construction, width, thickness, weight, strength, elongation, flexibility, flat surface abrasion resistance, and selvedge edge construction are all factors that contribute to defining a particular webbing. Each webbing material has its own performance characteristics and end uses. Cost Factor: Polypropylene is the lowest cost material available for webbings. Nylon and polyester materials are more expensive than polypropylene. While natural cotton can be inexpensive, dyed cotton can be expensive. Colour: Finished nylon webbing is easy to dye, however, its colourfastness is not as good as dope-dyed nylon. Polypropylene webbing is pre-coloured (dope-dyed) and is colourfast. Strength: Polypropylene, nylon and polyester fibres are stronger than cotton. High-tenacity DURALENE® polypropylene yarn is also available. Abrasion Resistance: Nylon provides the highest resistance to abrasion, and polypropylene has the second highest resistance to abrasion. © 2018 Karachi Webbing Company. Syntech Fibres (Pvt) Ltd.